Over the past 20 years El Sewedy Electrometer Group (EMG) established itself as a market leader by supporting Electricity, Water & Gas Utilities around the world with state of the art Metering Solutions and Energy Management Services. El Sewedy EMG’s portfolio has the flexibility to offer its customers from standard metering products and solutions to more complex value added services and energy distribution management agreements which tackle operational challenges of revenue collection, losses reduction and load management leading to better asset utilization, improved efficiency and operational cost reduction. 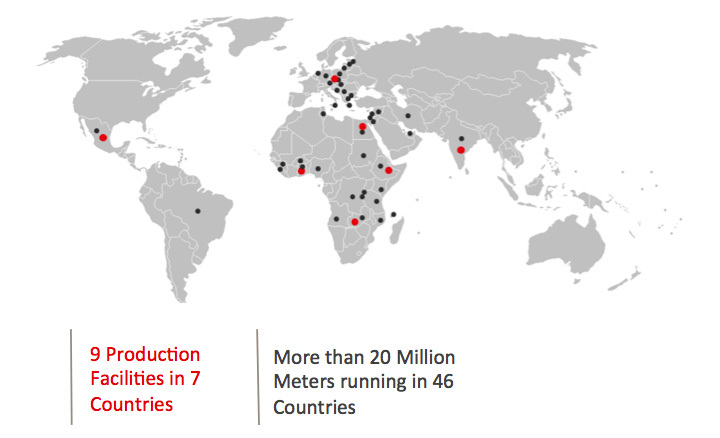 We cater to the needs of our customers worldwide through 9 production facilities in 7 countries with the ability to produce 5 million meters per annum and 4 R&D Centers strategically located across the world. Our extended Portfolio of Services also includes project finance, delivery of turnkey projects, technical service agreements, asset management, operation and maintenance, which enabled us to become true long term business partner to major Utilities globally. What separates us from most of our competitors is our continuous investment in R&D activities. Appointing 150 engineers to the task, we host the position of being one of the top five platforms for research and development in the metering industry worldwide. Our development teams located in four centers worldwide, namely Egypt, Czech Republic, Spain and India are responsible for all metering solutions and services during the design, engineering, production, installation, and operation processes. The support of our dedicated research team allows us to maintain our position at the forefront of the metering industry with new and innovative technologies launched to tackle the challenges facing Electricity, Gas and Water utilities around the world. We are constantly striving to better our customer support in areas of repair, upgrades, and training in order to allow our customers to fully capitalize on the various functionality and capabilities of their investments. We are able to cater to our expanding customer base through our equally expanding metering network. Instrumental to the contribution of such aggregate growth are El Sewedy EMG’s reliable customer service centers and factories situated in its various operating locations around the world. Today, with more than 1500 employees working at 9 production facilities in 7 countries and 4 R&D departments, El Sewedy EMG has the ability to produce 5 million meters per annum and cater our customers worldwide.